Here in the Midwest, and anywhere else for that matter, there is no more important piece of equipment for a farmer or anyone working in agriculture than their tractor. It’s the tireless workhorse, capable of doing or assisting multiple important jobs around the farm. So, it should go without saying that it’s crucial to keep your tractor well maintained and cared for. Whether it’s shiny and new or an old bucket of bolts you’ve been driving for decades, taking the time to routinely do the following checks and precautions will keep it running better for longer and help you avoid costly repairs or a total replacement in the future. 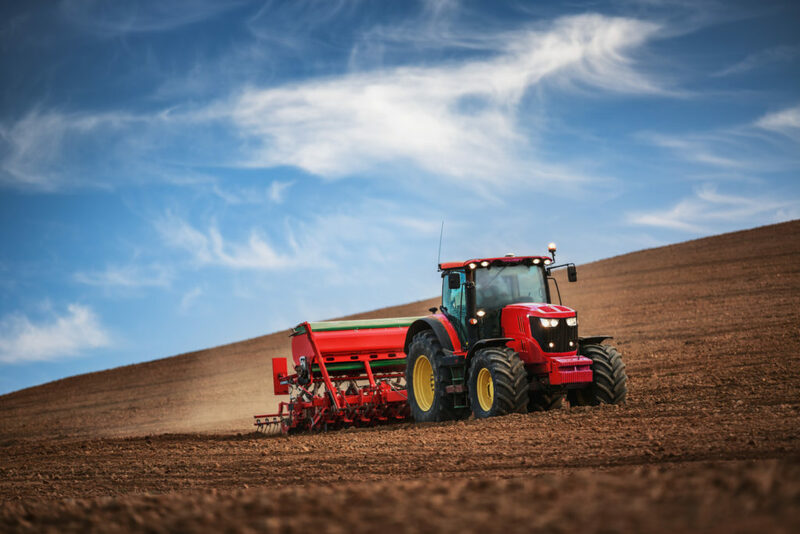 In between driving down back roads, gravel paths and through the fields, your tractor kicks up tons and tons of dirt and dust during a typical day’s work. Thankfully, your air filter keeps all that dirt and dust from making its way inside your engine. However, a clogged air filter can be just as harmful to your engine’s health. A clogged air filter will affect the performance of your engine. It will make it work harder than it needs to, speeding up wear and tear and drastically shortening its lifespan. Taking a minute to check your air filter every couple days takes no time at all and can save you in repairs down the line. Hold it up to light and look from the inside. If you are having trouble seeing light come through it’s a good idea to get a new one. Every vehicle, not just tractors, can greatly benefit from frequently checking fluids and keeping them filled. Oil, hydraulic fluid, coolant, transmission fluid and antifreeze (if you operate it during the winter) levels are all crucial to maintain in order to keep your tractor healthy and running without any hiccups. So, how often do you need to check your fluid levels? That can vary depending on usage. If you are running your tractor upwards of 12 hours a day, daily checks are smart since you are burning through more. If you are only using it a couple hours per day, a weekly check should do. We suggest checking them as often as you can, however, to ensure peak performance. Although some people use their tractor year-round, others won’t use theirs during the winter months and will elect to store it away until next spring and summer. If you fall into this category, there are a couple measures you can take to ensure your vehicle gets through the rough winter months in good shape. Whether you are keeping it out in the elements or in a barn, shed or garage, start by keeping it covered at all times with a tarp or blanket. This will give it a little extra protection from the elements and cold. It is also often a good idea to disconnect the battery and keep it stored somewhere warm during the winter. This will prevent the battery from freezing in the cold if you do not intend to run it at all. One of the most important things you can do for your tractor is to regularly check and monitor the health and quality of its tires. Quality tires kept in good condition can keep your tractor running longer and increase fuel efficiency. However, the rugged conditions that your tractor tires are exposed to can often quickly wear down tire tread or damage them. Regularly check the quality and condition of your tires. Not just the tread and air pressure but to ensure there are no signs of damage from thorns, nails, shards of wood or metal or dry rot. An unexpected blow out while driving is not only a major inconvenience for your work schedule but can cause serious damage to the wheel hub itself. One of the best ways to maintain the best possible condition for your tractor? It’s as easy as keeping it clean! Something as simple as taking some soap and water and cleaning off all the excess dirt, grass clippings and mud build up on the body and tires can do wonders. A good cleaning once or twice a week can rid your tractor of this kind of debris that can contribute to rust and regular wear and tear that can cut into the lifespan of your tractor. Raben Tire associates in our Agriculture division are farm tire professionals. Most have years of experience and all are very dedicated to the needs of our local farmers. We carry the finest farm tire brands for all applications. We have the right tire to fit your need and your budget. If your tractor tires are looking a little worse for wear and need repair or replacement, visit the professionals at Raben Tire.